The Philippine Health Insurance Corporation also known as PhilHealth also released their new PhilHealth Contribution Table for the year 2017. This contribution table is also applies from previous years. All the premiums of employed, self-employed, OFW or individual paying members are all based on this contribution table. The advantage of being a member if you are employed is that your employer will share 50% of the contribution depending on your salary bracket. There are 28 salary bracket in the PhilHealth contribution table. Starting from salary bracket 1 with a monthly salary of P8,999.99 and below up to salary bracket 28 for those who has a monthly salary of P35,000 up. For “Kasambahay” or household helpers receiving monthly salary less than P5,000 the employer will shoulder both the employee and employer share. 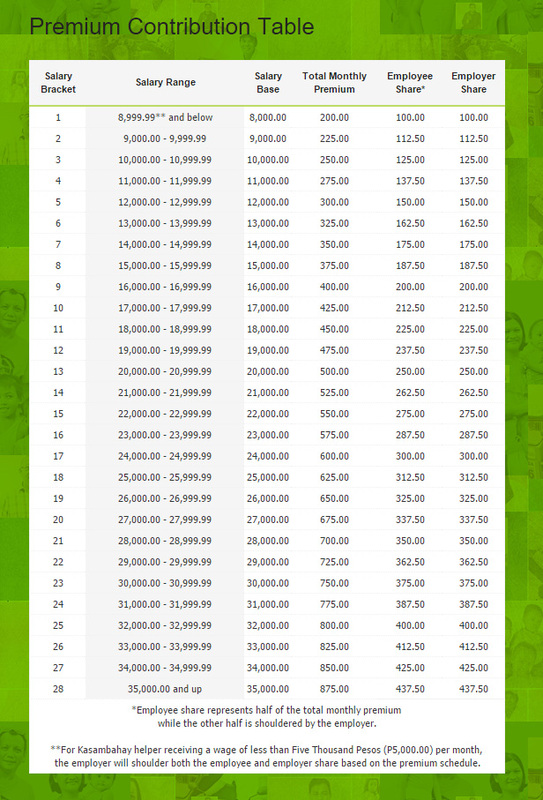 This is based on the PhilHealth Contribution table of monthly premium. This table below applies to all employed PhilHealth members where the employer will pay the half of the contribution. For Overseas Filipino workers, you have to options to pay your premium, annually for P2,400 or P1,200 Semi-annully. This is applicable for landbased OFW whether it is documented or not. Latest PhilHealth Contribution Table 2017 for Self-employed and Individually paying members. Self-employed and individually paying members with P25,000 and below monthly income can pay annual premium of P2,400 while for those who are earning more than P25,000 monthly they can pay P3,600 per year. Members under this category can pay their premium quarterly, semi-annually or annually depending on what is convenient for their budget. Members under this category are partially or fully subsidized by their sponsors like Local Government Unit (LGU), Private Entities, Legislators and National Government Agencies. The annual premiums for this member category is P2,400. Runner-Up Wrestles Crown Off Winner of Miss Amazonas Pageant! Newlyweds Elytte and Miranda Barbour Kills Man for Thrill!